PARIS, June 7 (JTA) — As the Palestinians continue to demand a “right of return” for refugees who fled or were expelled during Israel’s 1948 War of Independence, Jewish leaders from around the world are intensifying a campaign to advocate for the rights of Jewish refugees from the Arab world. The campaign to document the mass violations of Jews’ human rights in the Arab world, as well as the loss of their private and communal assets, will be launched in March 2006 by an American Jewish group, Justice for Jews From Arab Countries, and the World Organization of Jews From Arab Countries. Once compiled, the documentation will be catalogued and preserved by a special unit in Israel’s Justice Ministry. Representatives from the United States, Canada, Britain, France, Belgium, Italy and Israel met Monday in Paris to launch the campaign. Representatives from Mexico and Australia participated by phone. 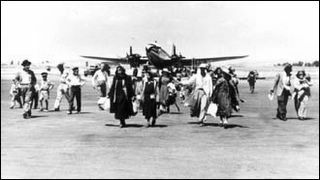 Some 860,000 Jews lived in 10 Arab countries, not including Iran, in 1948. Fewer than 8,000 remained by 2001, most in Morocco. 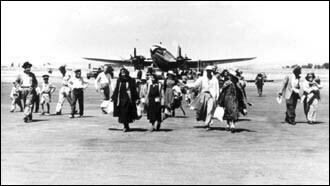 Many Jews were forced to flee their homes in the Arab world under duress, especially at the time of the Arab-Israeli wars of 1948 and 1967. They were granted refugee status by the United Nations, but the matter was never pursued. While Israel absorbed most of the Jewish refugees — their descendants today make up about half the population of Israel — Arab countries kept the Palestinians in camps and refused to give them citizenship, using their plight as a weapon in the political struggle against the Jewish state. Today, the number of Palestinian refugees and their descendants tops four million, according to the United Nations Relief and Works Agency, which provides them with services. According to Justice for Jews, the legal and political basis for the rights of Jewish refugees is U.N. Security Council Resolution 242, adopted in 1967, which declares that there should be a “a just settlement of the refugee problem.” The resolution does not make a distinction between Arab refugees and Jewish refugees. Delegates at the Paris meeting stressed that advocacy for Jewish refugees’ rights should not be about money or initiating legal proceedings. Waldman recalled fleeing with her family from Tripoli in 1967 as a mob was setting fire to her apartment building. She and six family members managed to get to Italy, the former colonial power in Libya, where they lived in one room. Her great-grandfather had founded a land development company in Tripoli, which employed more than 300 people when the family fled in 1967. Her father, she said, “never got over the loss” of the family business. Waldman eventually moved to the United States, while her parents stayed in Italy and a brother went to Israel. She has worked as a human rights activist for many years. “After Sept. 11, I decided it was time to speak up,” she said. Urman said Israeli officials have collected the case histories of some 3,000 families. Jewish organizations have been willing to get involved in the campaign. Justice for Jews will finance projects on the international level, while groups in participating countries would pay to compile the case histories. The group’s next meeting is scheduled for September in Paris.